Irene Wijnmaalen has created a complementary selection of richly historicised photographs. 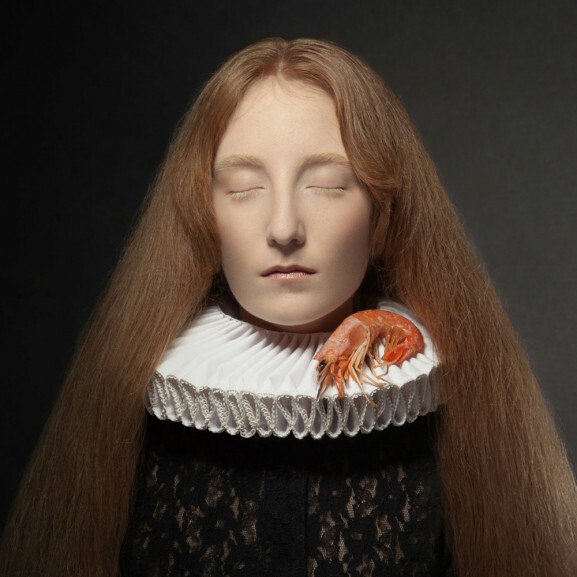 Fascinated by the Golden Age era of portraiture, she has used this aesthetic to express the dichotomy of purity and corruption behind female portraiture. Though the works’ chromatic filters rest on opposite ends of the spectrum, each young woman engages with the same narrative, and it’s no Jekyll and Hyde tale. Her coloured photographs depict young women in real life with sophisticated, contemporary details; however, it is through keen observation that sometimes the wolf is dressed in sheep’s clothing. She far from demonises her sitters, but rather situates them as still travelers amidst a “break”. Whether they’re running away from something or chasing something, everyone has a struggle in life.